Nurse-midwives, nurses, and doctors from Richmond, including Dr. Alice Hirata (right) work tirelessly with the women of Haiti to help make labor and delivery the life-affirming experience it should be. The RVA-based team behind Midwives for Haiti includes Alice Hirata, Stephen Eads, and Nadene Brunk, who founded the life-saving organization in 2005. Motherhood connects women worldwide. Taking care of mothers means healthier families, less poverty, and stronger communities. Midwives for Haiti, a Richmond-based non-profit, has built a bridge from Virginia to Haiti to keep women alive to raise the children they bring into the world. The number of orphaned children in Haiti is estimated to be over 750,000. 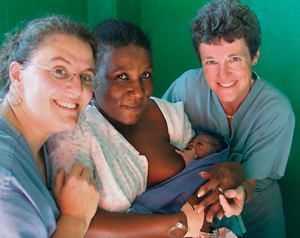 Midwives for Haiti saves women’s lives, allowing children to have mothers. There is no organization better suited to celebrate the month of mothers. Despite the ups and downs of our constantly changing healthcare system, we Americans trust that our babies will be delivered with trained staff and access to emergency care. In our country, we don’t view pregnancy as a potential death sentence. In rural Haiti, obstetrical care is often nonexistent. Women live too far away from hospitals or birthing centers, and many communities have no access to medically trained help to assist with prenatal care, labor, and delivery, or postnatal follow-up. The consequence makes pregnancy and childbirth the number one killer of women in Haiti, where the lifetime risk of dying in childbirth is one in eighty-three. The statistics for children are even worse, with one out of every fourteen dying before their fifth birthday. In the United States, it is not unusual for parents to celebrate and prepare for their baby well before giving birth. Nurseries are decorated and stocked with toys and layettes; cribs are bought; baby showers are hosted. When Haitian parents find out they are pregnant, they brace themselves for the possibility that the mom and/or the newborn might die. It’s not unusual for Haitian women to keep a safe detachment and wait to name their child until it appears likely the baby will survive. Initial mother-infant bonding may be difficult, especially if the woman has lost a baby before. In Haiti, motherhood is high risk. Founded on the concept that motherhood shouldn’t be a death sentence, MFH is dedicated to helping the women of Haiti pose for more pictures like this one. These grim statistics prompted Nadene Brunk, a certified nurse midwife who lives and works in Richmond, to take action. In 2003, Brunk visited Haiti for the first time as part of a medical team on a one-week service tour of care delivery. “It soon became obvious that this seven-day model was especially ill-suited for pregnant women,” says Brunk. In order to truly make a difference, Brunk recognized that pregnant women needed ongoing access to medical care. 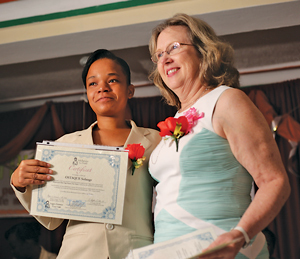 In 2005, she founded Midwives for Haiti (MFH) where she currently serves as executive director. “Nurse midwifery is based on the concept of low intervention,” explains Brunk, who spends part of every year training nurses in Haiti. “Nurse midwives support the natural process of birth, but are highly trained to screen for risk and recognize signs requiring life-saving medical intervention.” This model is ideal for Haiti, where the majority of births happen in the home. Not only is this tradition, it is often the only option due to lack of income, an inadequate number of trained medical professionals, limited transportation, and a dearth of hospitals, especially in rural areas. Too often, home births that could have had a good outcome with medical intervention end with fatalities. There are four main causes of maternal death related to pregnancy: eclampsia (caused by high blood pressure), hemorrhage, infection, and obstructed labor. Recognizing what it takes to prevent or care for these issues is essential to saving lives. Dr. Hirata, inspired by her Virginia Women’s Center colleagues Brunk and MFH Medical Director Stephen Eads, MD, made a commitment to serve twice a year in Haiti. “MFH gives a voice, a purpose and empowers the women of Haiti. Our program provides jobs and a knowledge base that multiplies as women share their stories with each other,” says Dr. Hirata. With education, basic medical supplies, and improved access to care, the risks of pregnancy and childbirth can be greatly decreased for Haitian women. In the ten plus years since this outreach program was founded, MFH has initiated a number of programs to reduce maternal and infant mortality. Skilled birth attendant training is a prime example. This 12-month program trains Haitian nurses to become skilled birth attendants (SBAs) who specialize in identifying and treating high-risk pregnancies. The program started with nine committed nurse-students meeting outside around a donated blackboard. “Our goal is to empower through education rather than just provide services,” explains Brunk. Now, ten years later, MFH has formal classroom space and has trained almost one hundred SBAs who have assisted in more than 60,000 prenatal care visits and over 12,000 deliveries. It’s important to keep in mind that a typical Haitian hospital is very different from an American healthcare facility. Here in the United States, many hospitals offer birthing classes, nursery tours, and beautifully appointed labor and delivery suites. Many American women can choose to have epidurals to help minimize the pain that comes with pushing out a baby. 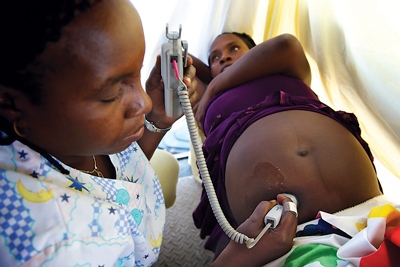 A pregnant woman receives prenatal care from a skilled birth attendant at a mobile health clinic in Haiti. When MFH started, their first training site was St. Therese, a hospital that didn’t even have running water, toilets, showers, or electricity. It was a decaying structure where a family could bring their own sheets, food, and supplies, and expect to find a medically trained professional to help them with an emergency. Staffing was so limited that no one worked in the evenings or on weekends, and women felt unsafe staying overnight. Now, thanks to the Haiti Ministry of Health, MFH, and other service organizations, St. Therese has a well for water, electricity, and adequate obstetric staffing. 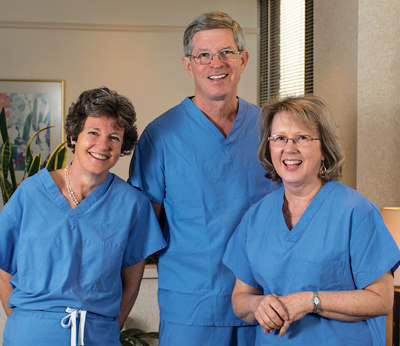 The hospital employs sixteen SBAs who work around the clock to meet obstetric demands. In 2013, for example, SBAs and MFH students who train at St. Therese attended to more than two thousand births. The community now regards St. Therese as a safe place to give birth. Still, there is no such thing as a private suite. Multiple women give birth in the same large room without privacy. Epidurals aren’t part of the birthing plan. SBAs are primarily based in hospitals, as they need to work where they can be paid and have access to supplies. This helps with Haiti’s extreme demand for obstetric health professionals, but it doesn’t benefit families who live too far away to get to a hospital. In rural communities, matròns are responsible for supporting women through childbirth. Matròns are traditional birth attendants who learned how to assist childbirth by other lay-women in the village, the knowledge passed down through generations. They have no formal training and limited education. Seventy-five percent of births in Haiti are attended solely by matròns. Although respected, wise, and essential community members, matròns often lack the basic knowledge and tools needed to help prevent and deal with complications of pregnancy. Since the majority of matròns can’t read, MFH developed songs to teach everything from cleanliness technique to understanding warning signs and symptoms. Besides being a wonderful memory, Dr. Hirata says she appreciates this example because it shows the education components that are taught by MFH are shared to work with the Haitian culture, not against it. Unfortunately, even with recognition of high-risk symptoms, many women simply can’t leave their village. Most families don’t have vehicles or the money to pay a driver. Often, actual roads to the closest hospital don’t even exist. To address this common issue, MFH purchased two all-terrain vehicles to be used as mobile clinics. The trucks, a custom-built pink Jeep and an all-terrain SUV, have enabled SBAs to visit twenty different villages in the foothills of the Central Plateau region and provide more than 6,000 visits annually. Each pregnant woman receives education, an exam, vitamin and iron supplements, screening for sexually transmitted infections, malaria, vaginal infections, intestinal worms, and high blood pressure. Left untreated, these infections could be disastrous for mother and baby. Brunk tells a story all too common in Haiti about a woman suffering from preeclampsia, high blood pressure during pregnancy that can lead to seizures, strokes and death. SBAs rushed her to the hospital in the pink Jeep, saving her life. Regrettably, too often this is not the case. Haitian women are at higher risk for eclampsia due to malnutrition, early chronic high blood pressure and lack of clean water. Early symptom recognition during prenatal assessments is key. Nadene Brunk poses with a recent graduate who will serve as a skilled birth attendant in Haiti. While the mobile system is saving lives, MFH founder Brunk believes that building rural birthing centers throughout Haiti is the ultimate solution to care for high-risk pregnancies in remote areas. SBAs, mobile clinics, and the matròn outreach program have made a huge impact, but the reality is there often aren’t options for rural women during an emergency. Women who need a C-section or IV medication for hemorrhage or eclampsia aren’t able to get to the hospital at their time of need. Brunk’s hope is that these simple, focused birthing centers will provide needed access to physicians and midwives, especially for complicated deliveries. Here’s how to support Midwives for Haiti. 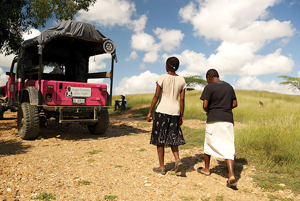 Haiti’s challenging topography combined with high-volume usage has put the pink Jeep, one of two vehicles Midwives for Haiti relied on for medical transport, out of commission. “Our trucks take a beating because to get to villages in the foothills, we have to drive off-road,” explains Nadene Brunk of Richmond, the certified nurse midwife who founded MFH in 2005. 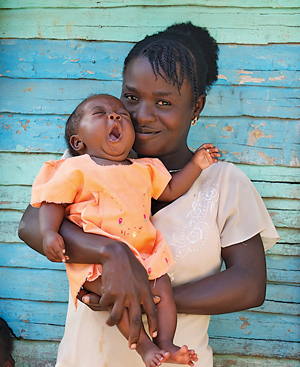 On average, six Haitian midwives see about six hundred women a month at twenty remote villages. That’s up to 120 mothers on a single day – and a lot of miles. “Our sturdy pink Jeep finally fell apart leaving us with only one SUV mobile clinic,” says Brunk. To respond to this loss, MFH launched a fundraising campaign last month. Brunk says the goal is to raise $60,000 to cover the cost of seeing 6,000 women at $10 a visit. The message? “$10 per visit. Two lives. Life Changing.” Please support the effort at Midwives for Haiti. Sherrie Evelyn Page is a freelance writer and proud mom of two teens, who frequently writes on topics related to parenting and wellness. When not attending shows or games, Sherrie enjoys yoga and power walking. She is also a registered nurse and teaches health at St. Catherine’s School.